A group of 39 community members from TEDxMtHood and Portland Story Theater gathered in the cozy Alberta Abbey Annex Wednesday, Sept. 9 for an Adventure in Storytelling. 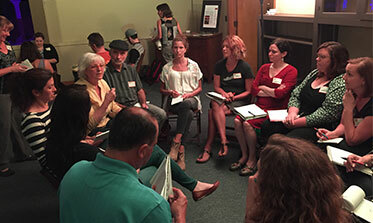 Broken into groups, Adventure attendees learned about four elements of storytelling from theater members. Participants were equipped with tools to discover their inner storyteller and share their stories in the world. “Storytelling teaches us skills to be empathetic toward ourselves and others,” said co-facilitators Lynne Duddy and Lawrence Howard, kicking off the interactive 90-minute workshop. Lawrence urged attendees not to drown their audience in background as they open their stories. Instead, he said storytellers should use simple, strong, straightforward statements. 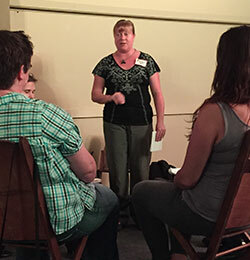 Lynne gave participants advice on how to discover their stories by “reflecting on experiences that have shaped their psyche and spirit,” saying it doesn’t have to be a really dramatic thing, but something that has somehow changed them. She explained that zooming in on specific anecdotes in a set time frame can help clarify story development. The goal is for storytellers to share stories that they need to hear about something that matters deeply to them. Portland Story Theater believes that everyone who hears these stories is changed, transformed and shaped by the truth of the moment they share with the storytellers. Penny recommended storytellers work on two techniques: staying calm and breathing. She also encouraged participants to develop their own preparation routines before shows. One storyteller, for example, imagines a warm pot of honey oozing over her head, coming down her body and grounding her to earth. “The most impressive thing is the feeling you convey, not the words you say,” Penny said,” describing how just being on stage can make storytellers seem like heroes to an audience. Storyteller Leigh Hancock rounded out the night, encouraging participants to be with their stories and really know their stories. She recommended memorizing the first line of a story as a comfort and an effective way to draw an audience in. One exercise Leigh referenced was mapping out a story in visual clues and reminders. “If you get off track, you can always get back on,” Leigh said. To learn more about Portland Story Theater and its upcoming season, visit portlandstorytheater.org or call 503-284-2226. The TEDxMtHood Planning Team will take a fall hiatus from Adventures and looks forward to kicking off 2016 with a lineup of dynamic events. 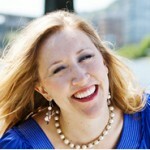 Lisa Anderson is a Hawthorne-based storyteller, adventure lover and a dress-up queen. She’s one of several storytellers who will be sharing write-ups, interviews, and perspectives on the many extraordinary people from our surrounding community.